Tom Petty And The Heartbreakers are to play their first major UK show for 20 years after being announced as headliners for next year's Isle Of Wight Festival. The band, whose well-known songs include Free Fallin', I Won't Back Down and American Girl, will top the bill on the main stage on Friday June 22. The show also marks the act's first UK festival appearance. 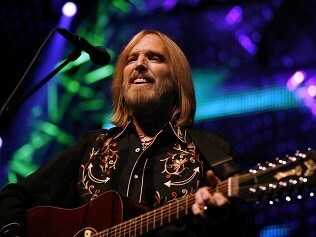 Petty and his band became huge stars in the US in the late 1970s and have continued to score hits regularly ever since, although they have barely troubled the UK singles chart. John Giddings, the festival's promoter, said of the band's booking: "It has taken years to achieve but I'm sure it will be worth the wait - they are one of the greatest rock and roll bands of all time." Also appearing at the Isle of Wight Festival in 2012 are Bruce Springsteen And The E Street Band, Elbow, Biffy Clyro and Noel Gallagher's High Flying Birds. Carrie Underwood's fans have come through for her again, giving her another win at the American Country Awards. Gareth Malone's choir of military wives has become the bookies' favourite for the Christmas number one, after edging ahead of the X Factor winner. The Duke and Duchess of Cambridge will join the Prince of Wales and Duchess of Cornwall at a fundraising concert hosted by Gary Barlow. Lily Allen has spoken publicly for the first time since the birth of her baby girl in a message to her Twitter followers. Jessie J brought the bling into the Jingle Bell Ball, as she closed the two-day pop extravaganza in a gold catsuit. Adele's chart-topping release 21 has become the biggest-selling album of the century. Amy Winehouse's father had to make himself listen to her new album to be sure of its quality - despite finding it "difficult" to hear his daughter sing. Madonna will perform at half-time during the US Super Bowl in February. Madonna will perform at half-time during the Super Bowl in February.